I know I know, enough about Cafe Rio already. But we went and it must be documented for our future posterity. Cafe Rio opens at 10:30am (at least the one in Manhattan Beach does, not sure about any of the other locations, though I'm assuming they all open 'round the same time) so I wanted to be there at about 11 to avoid the lunch rush. Who eats lunch at 11am right? Chris Olson texted us when we were about 10 minutes away and said the wait was two hours! We were still gonna go, Cafe Rio is simply worth the wait, but it turns out he was lying. There was no wait. Score. The purpose of this picture is three fold. 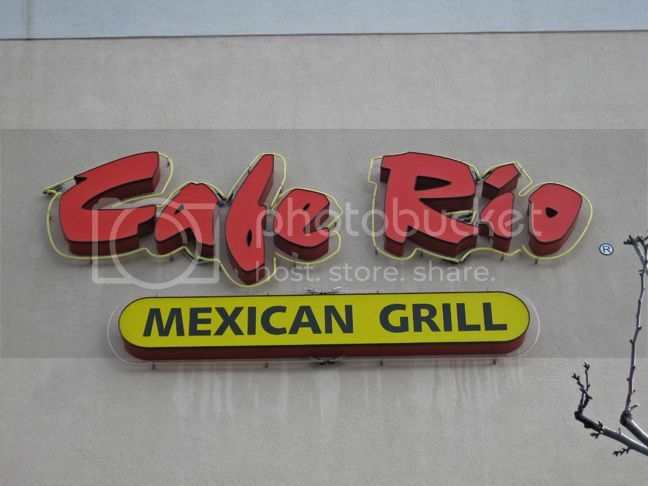 One: to show this Cafe Rio does exist. Two: to show Jenny's genuine enthusiasm. Three: to show the Chris' performing their secret handshake...??? This is what all of the fuss is about my friends. Pork burrito. Enchilada style. We even got one of our meals for free cuz we had a full frequent diner card from when we lived in Utah. We planned to use it on our very last day in Utah, but moving took a lot longer than expected. We were saving it for our next trip back there but not no mo! 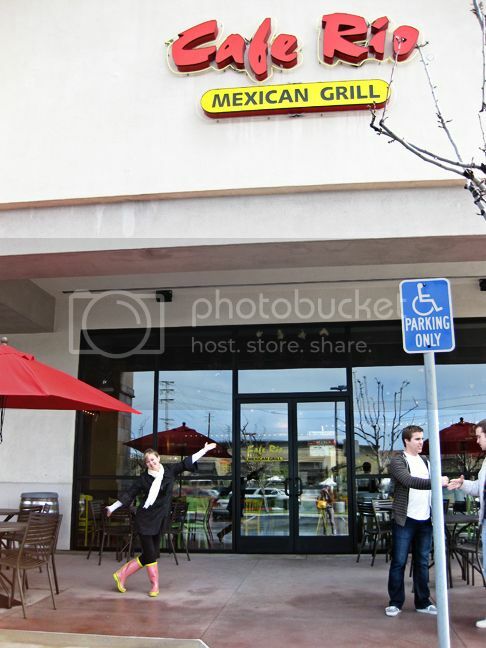 We've got our own Cafe Rio now, hallelujah! This is the face of pure bliss. The gang and our meals. Let me just say Cafe Rio is like a legend in our religion. 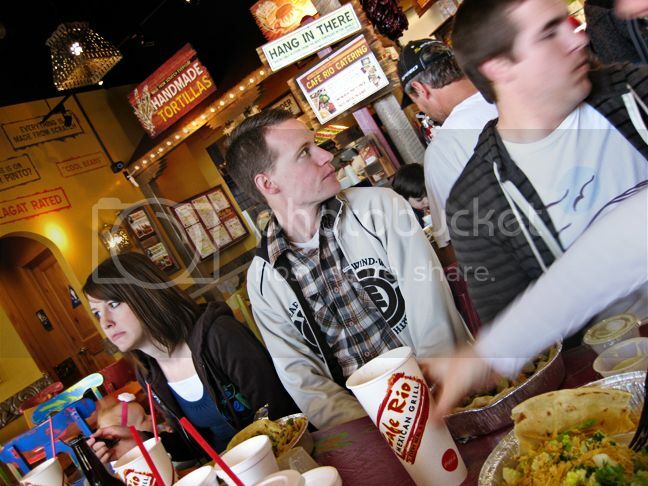 If you ever want to be in good company, just head to Cafe Rio. You're almost guaranteed to meet up with a random old friend. Chris Olson did! 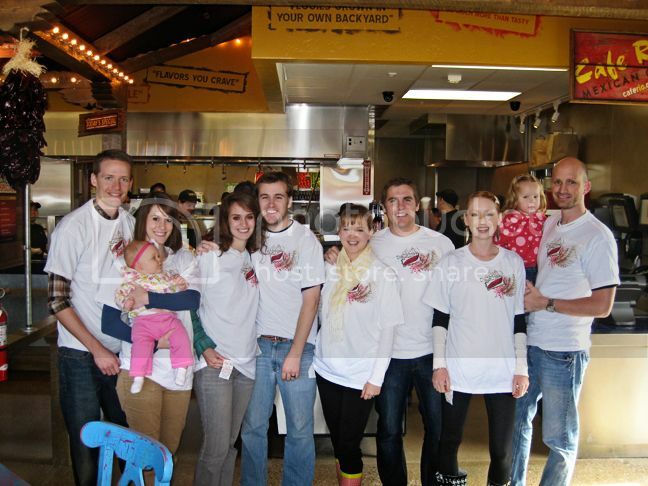 We actually recognized one of the workers in the assembly line from the Provo location. We told him we had all just moved to California from Utah and he was so happy to see us he gave us free drinks. Then Blake went up to him later and asked where we could get the Cafe Rio t-shirts we'd seen people sporting around and a few minutes later he came back with an armful of shirts for each of us. Just wait, it gets better. Attached to each t-shirt is a tag for a free meal! We are SOOOO going back next Saturday. It's just like the good old days when we'd go into Baskin-Robbins and all of us would come out with a little tiny scoop and you'd come out with a gigantic scoop. You're streak remains intact. First off, that Cafe Rio was awesome! They were super nice to hook us up with all that stuff! 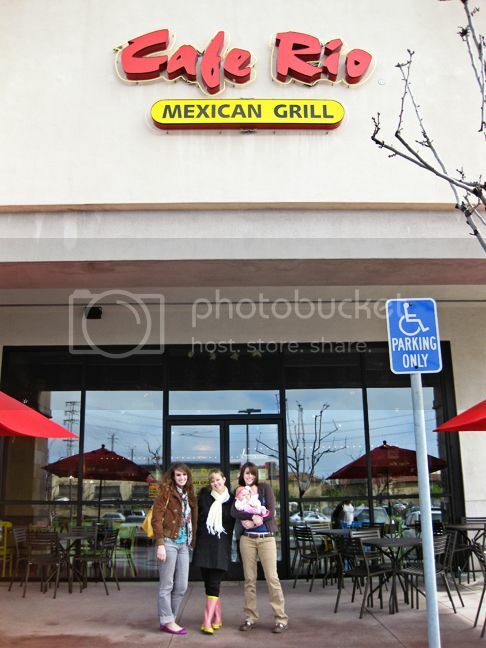 Second, if you have not been to a Cafe Rio but you live in California, Nevada, Arizona, Utah, Idaho, or Colorado you MUST GO! It's amazazazing! 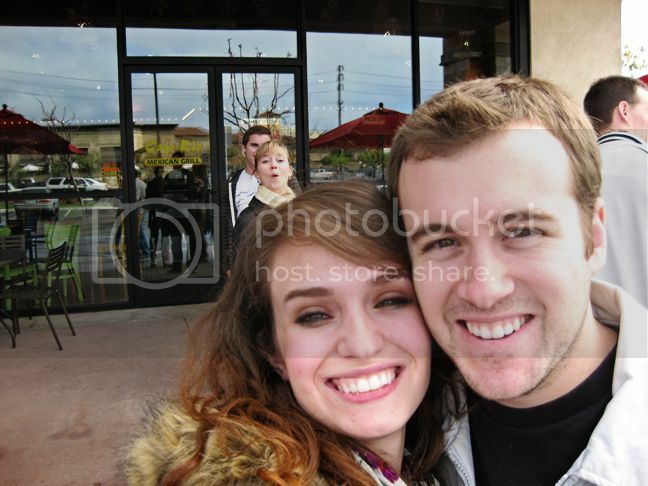 LOL - you guys are too cute - and may I say both you and Chris have dazzling teeth?! Sounds yummo - the East Coast has nothing on West Coast Mexican food, I can tell ya that! I miss that something fierce! Woo-Whoooo! It was amazing! Hit the spot. Thanks for planning it!!! I'm so jel. So cool you got the shirts and free stuff! 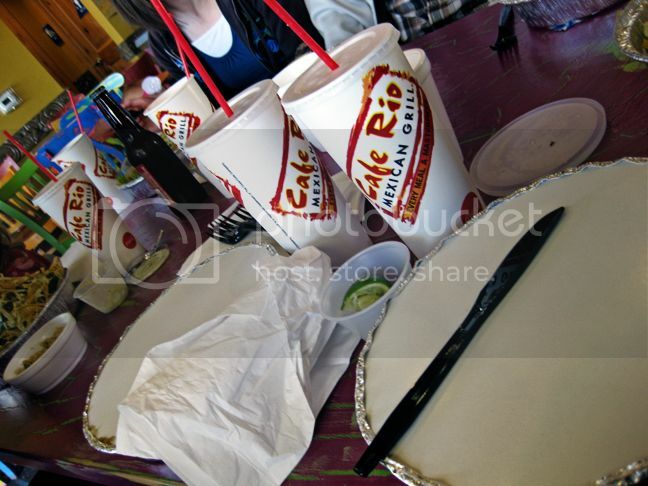 I miss Cafe Rio! MAN I'm jealous! I am an East Coast Girl, and I've only heard of Cafe Rio from you and some other bloggers. If I ever make my way out west, you know I'll be making a stop at Cafe Rio a top priority! Not only did you get to eat there, but score on all the free stuff! That rocks! 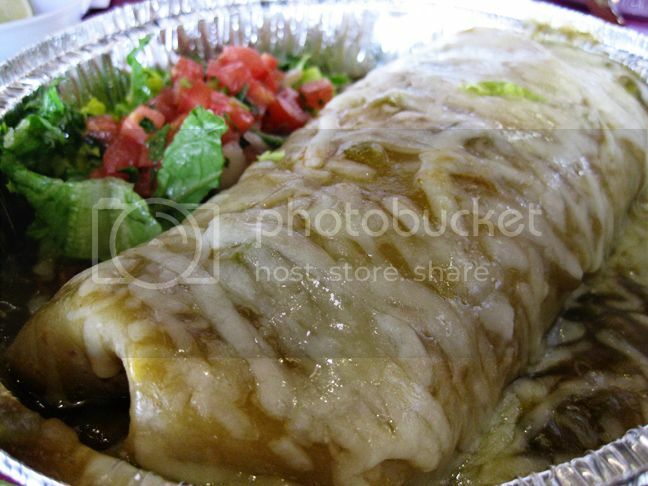 And yes, that burrito looks awesome!!! I went there yesterday, just because of you. It was delish! 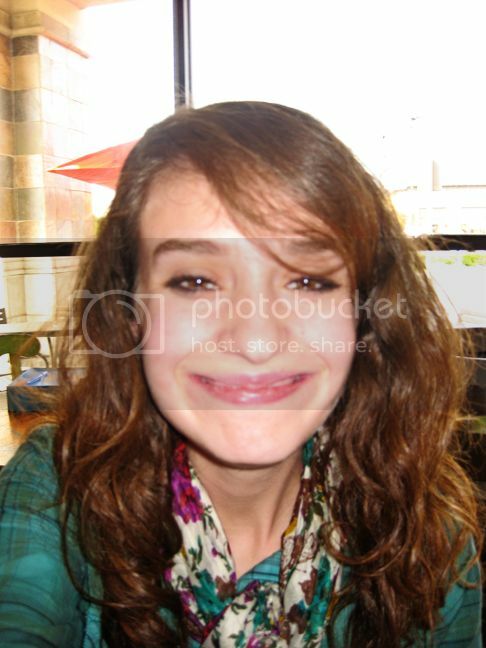 OMG you are too funny! Now I must go. Mexican food is my fave!!!!!!!!! !